The Batten Disease Family Association (BDFA) is a national charity which aims to support families, raise awareness and facilitate research into the group of devastating neurodegenerative diseases commonly known as Batten disease. We are based in Hampshire but work with children, young people, families and professionals across the UK. We were in formed in 1998 with the help of SeeAbility and Contact-a-Family, by a small group of parents of children with Batten disease . We were granted Registered Charity status in 2001 and the work of the charity has continued to go from strength to strength. 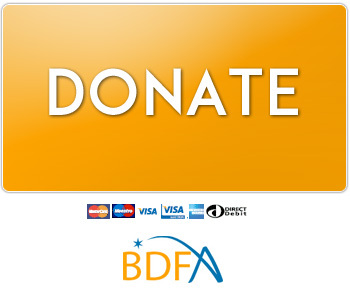 The BDFA’s mission is to: Bring light to Batten disease by being the central point of excellence in the UK for raising awareness, supporting affected families, and facilitating research into the disease. The BDFA will continue to optimise the support it gives affected families and related health professionals. We also plan to actively increase the awareness of Batten disease, contributing to national decisions on management of the disease and continue to facilitate UK and worldwide clinical and research developments. Over the last 10 years, research has developed significantly and much more is understood about the disease with many more gene variants of the disease identified. For most Batten disease types, research is at or will come to a point of needing to trial different therapies over the course of the next decade, both in the laboratories and clinically. The BDFA plans to contribute significantly to the course of these developments, particularly in the UK. The BDFA plans to become the national voice for Batten Disease service development in the UK. As the only dedicated UK Batten Disease charity supporting affected families, raising awareness and facilitating research into the disease the BDFA now aims to become a stronger UK voice for Batten Disease in order to communicate and implement members’ wants and needs and influence UK decisions on the management of Batten Disease whilst continuing to facilitate research into potential therapies and ultimately a cure.